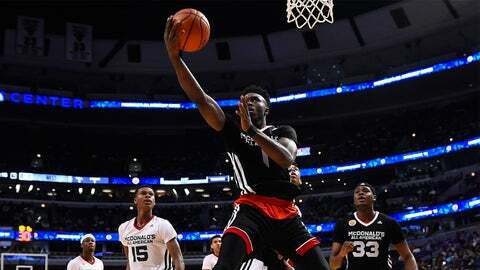 Jaylen Brown is one of two McDonald's All-Americans joining the Golden Bears this season. The Cal Golden Bears have high expectations in Cuonzo Martin's second season. A reason for that is the heralded recruiting class headlined by Ivan Rabb and Jaylen Brown. On Friday night at Cal's “Late Night with the Bears,” Brown showed off the athleticism that made him one of the highest-rated recruits in the Class of 2015 by throwing down a 360 between-the-legs dunk in layup lines. Cal was picked to finish second in the Pac-12. The Golden Bears open the season on Nov. 13 against Rice.